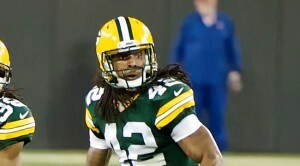 FantasyScore’s Ryan Dodson selected Morgan Burnett with the 6th pick of Round 11. Please note that the picks with asterisks were auto-picked. Also note that many asterisks were properly taken from pre-ranked queues. And do make sure to enjoy the comments from the league participants at the bottom of the article. The key picks coming in for my tram were Justin Forsett, Kendall Wright and perhaps Shane Vereen. As a full PPR (1 pt for both receivers and RB) Forsett’s potential value under the new offensive system is magnified. Although he only managed 44 catches in 2014 receiving is a huge part of his game and last year under new offensive coordinator Marc Trestman, Matt Forte amassed 102 catches. Forsett is getting a bit long in the tooth and has always been dogged by his lack of size, but he has been very durable and doesn’t have a lot of mileage on his body. I am a big fan of looking for value in QB/WR combinations where the quarterback establishes a connection with a receiver who might be viewed as having less talent. Think Julian Edelman and….Kendall Wright. Wright, despite modest pre-season numbers is clearly the favorite target for rookie QB Marcus Mariota and his possession style should translate well to targets during the inevitable rookie struggles and with Tennessee’s obvious offensive shortcomings. Shane Vereen is slotted to do situational work for the Giants and is behind the oft-injured Rashad Jennings and competing with the lackluster Andre Williams for the part time work. Williams has been dreadful this preseason and has not earned many friends on the Giants staff. I’m hopeful that Vereen will slice out a big part of the pie in the Giants distribution offense. If not, he’s my current flex and those can be plugged-and-played. The other two picks to consider are the uber-talented Phillip Dorsett who has really caught the attention of the Indianapolis staff and is frequently talked about as a red zone receiver and the aging Reggie Wayne. With Brady’s suspension vacated (and unlikely to be reinstated) Wayne is precisely the kind of sure-handed route runner that should connect with Brady, particularly while Brandon LaFell is on the PUP.